A team of researchers at Western and Lawson Health Research Institute has identified a novel way that a common virus, called adenovirus, causes disease. In doing so, they have discovered important information on one of the body's key immune responses. Their findings, published today in Cell Host & Microbe, may have implications for infectious diseases and cancer. Adenovirus infections most often cause mild illnesses of the respiratory system, resulting in runny noses, coughs and sore throats. However, researchers have been interested in adenoviruses since the 1960s, when it was discovered that they can cause tumors in rodents. These tumors arise because adenovirus infected cells divide uncontrollably and escape the immune response, which are hallmarks of cancer. One key component of antiviral immunity is interferon. "Interferons are proteins made and released by cells in response to the presence of viruses, bacteria, parasites or cancers," says Dr. Joseph Mymryk, a professor in the Departments of Microbiology and Immunology, and Oncology at the Schulich School of Medicine & Dentistry and scientist at Lawson. "Adenovirus is completely resistant to interferon." 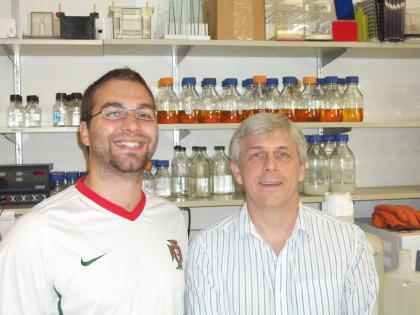 Past studies have identified some of the ways in which adenovirus overcomes the interferon response, but Dr. Mymryk and Greg Fonseca, PhD Candidate and lead author on the study have identified a new mechanism that relies on changes in epigenetic regulation. Epigenetics is an emerging field of study which involves non-genetic factors that cause an organism's genes to express differently. Production of interferons are responsible for the majority of symptoms commonly associated with viral infection including fever, chills, muscle aches, and malaise. When a cell is exposed to interferon it increases the production of about 300 cellular genes that defend the cell from infection. The researchers have discovered that interferon-regulated genes require a specific epigenetic modification called monoubiquitination of histone 2B (H2B) to work. "There is still much to learn about this modification, but our studies are the first to show that it is absolutely required for the interferon response," says Fonseca. "This finding was totally unanticipated." "Each cell has thousands of different genes and they can all be regulated in weird and wonderful ways," says Dr. Mymryk. "The monoubiquitination of H2B specifically results in large increases in the transcription of genes. We found that the interferon response uses this modification for the rapid increases in gene transcription (which leads to gene expression) that are needed to change the cell environment to respond to and stop the viral infection. What the virus does is essentially block the formation of the complex that performs the monubiquitination of H2B, thereby blocking its function." Although the medical consequences of adenovirus are typically modest, the study's findings have implications in a broad range of diseases because of how influential the interferon response is to how we respond to infectious diseases and cancer. "Many cancers are non-responsive to interferon," says Fonseca. "If we can more fully understand the mechanism of interferon response, we may be able to better treat these cancers. Overall, many of the tricks adenovirus uses may be similar to those used by other viruses and cancer cells."